Is that a celestial swan? Perhaps a lobster? The nebula featured in this beautiful image is officially catalogued as Messier 17 and NGC 6618, but it is called many different names, including the Swan Nebula, the Horseshoe Nebula, the Lobster Nebula and the Omega Nebula. Former NASA scientist Fred Herrmann of Huntsville, Ala., used a Takahashi TOA-130 Telescope, STT-8300 Monochrome CCD Camera, and Ha and Oiii elemental filters to capture the nebula image, which he sent to SPACE.com on Sept. 25. Located roughly 6,000 light-years from Earth in the constellation Sagittarius (The Archer), Messier 17 is one of the youngest and most active hot beds of star formation within the Milky Way galaxy. 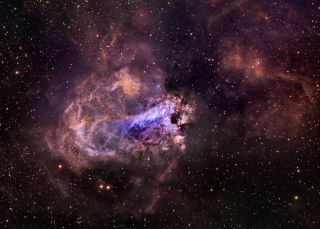 The nebula stretches 15 light-years in diameter, the center of which is packed with gas and dust, which are the raw ingredients from which new stars are born. A light-year is the distance light travels in one year, or about 6 trillion miles (10 trillion kilometers). Follow SPACE.com on Twitter @Spacedotcom. We're also on Facebook & Google+. Original story on SPACE.com.